My coworkers and I baked several different Betty Crocker cookie recipes to celebrate a partnership with Betty Crocker. You can read about it on 1000 Words blog. I made the Mexican Chocolate Cookies, which was convienent because I had Mexican chocolate tablets leftover from the baked apples I made for my Halloween dinner. I love using this Mexican chocolate... it's called Abuelita and is made by Nestle. 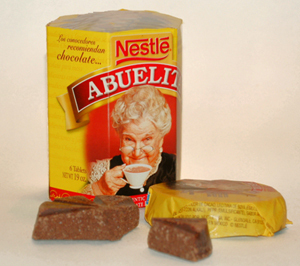 Abuelita means "little grandmother" and there is picture of one on the packaging. I like it for hot chocoate, but it can be used for many things. 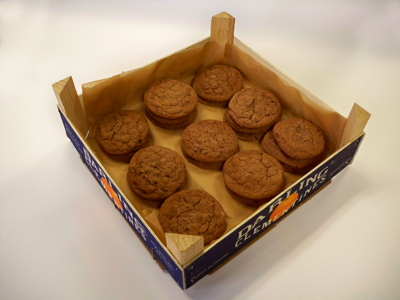 It was very good in these cookies! Note the super cool carried Aaron made me to carry the cookies in. 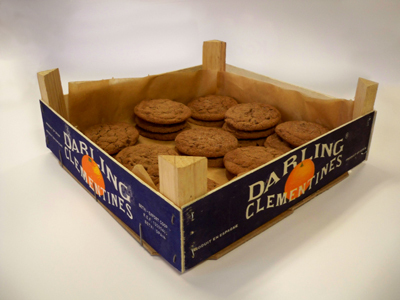 He made it out of two used clementine boxes. Crafty! What's the difference between regular chocolate and Mexican chocolate? When I was little my grandmother use to give us chunks of the Abuelita as candy. Yum! I still love the taste of it. Chocolate tablets? That sounds great. I've never heard of that before. Mexican chocolate usually has other spices in it like cinnamon.